The Presbyterian Church in Canada has its historical roots within the Church in Scotland, following closely its doctrine, church government and forms of worship. 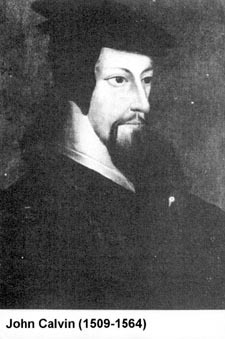 The structure of the Church of Scotland itself, stems largely from the work and thought of John Calvin (1509-1564). Calvin’s Institutes of the Christian Religion, published in 1536, along with the form of Church government and discipline he established while in Geneva, appealed strongly to those leading the movement towards church reform in Scotland. 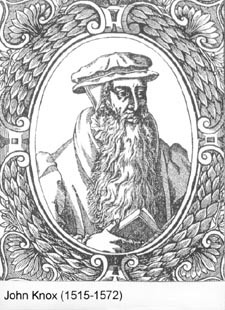 Most notable of these leaders was John Knox (1515-1572). 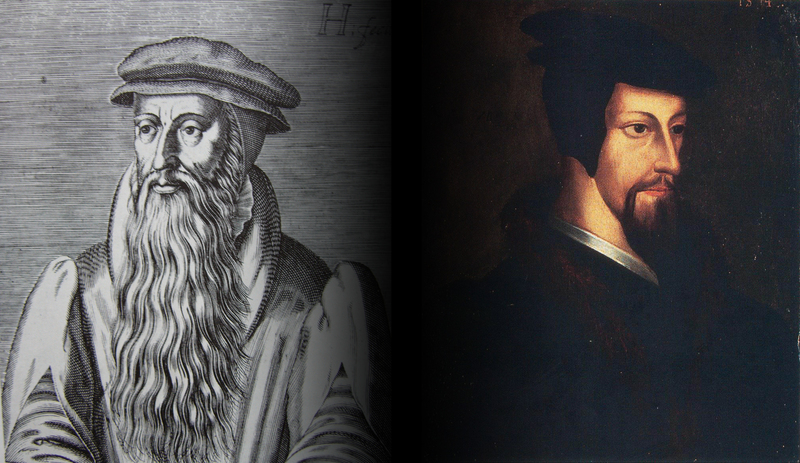 Knox admired the pattern of church life he saw in Calvin’s Geneva, and through his influence, a Calvinistic pattern was imposed upon the Church. Following the death of Knox in 1572, the movement towards a Presbyterian style of church government within the Church of Scotland was consolidated by Andrew Melville (1545-1622), and later confirmed by King James VI of Scotland in 1595. 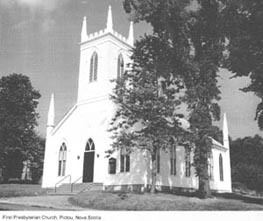 Through the settlement of Eastern Canada by Scots Highlanders beginning in the 1700s, and through the migration of Loyalists into Upper and Lower Canada in the late 1700s and early 1800s, Presbyterianism was brought to the “New World”. “The Presbyterian Church in Canada” was formed in 1875 from the union of four separate Presbyterian groups. 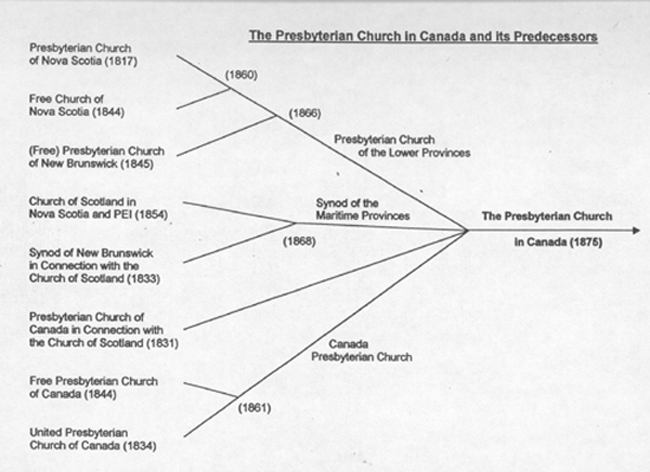 Due to the fragmented character of Presbyterianism in Scotland, there was a corresponding fragmentation in this country as well, and by 1850 there were seven distinct Presbyterian organizations in what is now Canada. The forces of disunity, however, began to retreat and by 1868 several regional unions had taken place, leaving four Presbyterian groups in the new Dominion of Canada. After several years of meetings and discussions, these four branches came together in 1875 and agreed to unite as one body called The Presbyterian Church in Canada. The first General Assembly of the new Church was held in Montreal in June 1875, and Rev. Dr. John Cook, minister of St. Andrew’s, Quebec, was elected Moderator of the 1st General Assembly of The Presbyterian Church in Canada. Lured by the prospect of becoming farm owners, several families of Scots Highlanders settled the area around Pictou, NS, in 1773. 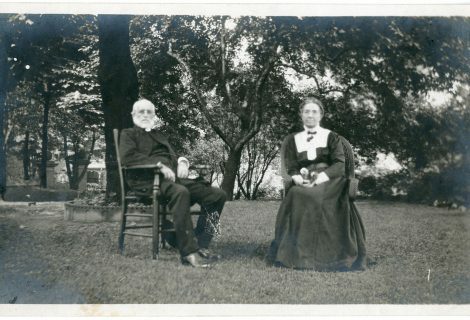 Their repeated calls at securing a missionary from Scotland were finally answered with the arrival of the Rev. James MacGregor, who immediately established a congregation (First Presbyterian Church, Pictou) and began holding services outdoors under the shade of an old oak. Later known as “the Apostle of the Maritimes”, MacGregor served tirelessly in this new land for 44 years until his death in 1830. During his ministry he travelled across great distances through the unbroken forest in his zeal to minister to the remote pioneer settlements across Nova Scotia, Cape Breton and Prince Edward Island. The Rev. Thomas McCulloch, who had arrived in Pictou in 1803, quickly noted the poor state of education in Nova Scotia, and soon opened a small school in his own home. 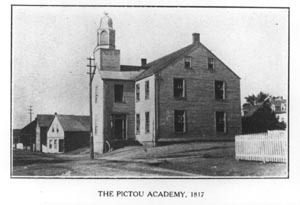 His dream of eventually opening a seminary to train and educate ministers locally was realized in 1817, with the chartering of Pictou Academy. He was elected president of the Academy and taught Greek, Hebrew, systematic theology, logic, and moral and natural philosophy, while still continuing to serve his congregation. He later became president of Dalhousie College, Halifax, where he continued to teach theology until his death in 1843. 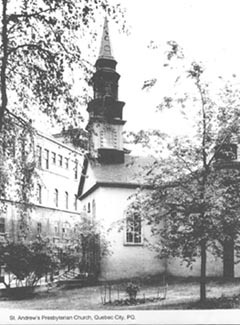 St. Andrew’s Presbyterian Church, Quebec City, traces its origins to 1759, when The Rev. Robert McPherson, a Church of Scotland chaplain to the 78th Fraser Highlanders in the British Army, held services for his men during their first winter in Quebec City. Some of these soldiers remained in Quebec after their tour of duty was over, and by 1765, a small congregation of Presbyterians was formed. The Rev. 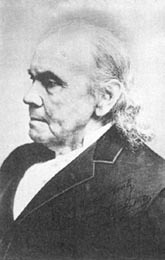 George Henry served the congregation following the death of McPherson, and was in turn succeeded by the Rev. Alexander Spark. Originally known as “the Scotch Congregation”, it was during Spark’s ministry that the present Church building was constructed and dedicated on St. Andrew’s Day, 1810, becoming known as St. Andrew’s Presbyterian Church. 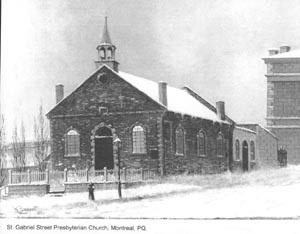 A congregation of Presbyterians was first formed in Montreal in 1786 by the Rev. John Bethune. Bethune left Montreal after only one year, however, and it wasn’t until the arrival of the Rev. 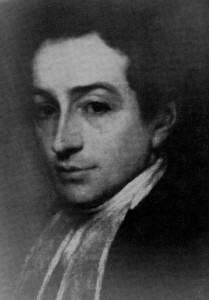 John Young from the Presbytery of New York in 1790, that the congregation had another minister. The congregation began construction of its own church building on St. Gabriel Street in 1792. The records of this congregation begin in 1791, and make up the oldest collection of documents in our Church’s archives. The Rev. John Bethune, being a former Loyalist officer, received a grant of 3,000 acres of land for himself and his family, prompting him to leave his new congregation in Montreal and move to Williamstown, Glengarry County, in 1787. The first church in Williamstown was built in 1787 out of logs and served as a school to the community during the week. Bethune went on to establish churches across Glengarry County, and eventually baptised 2,576 persons during his long and fruitful service. William King, a missionary of the Scottish Free Church in the United States, who had inherited fifteen slaves, approached the Free Church Synod in Canada in 1848 with hopes of receiving aid to help settle these slaves, now freed individuals, in Upper Canada. King’s hopes were fulfilled when Lord Elgin donated 9,000 acres near Chatham for the settlement, known as the Buxton Mission, and the Synod soon appointed a committee to superintend the mission. Once established, the settlement quickly began to attract many fugitive slaves that had made their way north into Canada by the “underground railway”. By 1857, over 200 families had gained their freedom and were settled in the community. “Go West Young Man”! In 1881 the Canadian Pacific Railway finally reached Winnipeg. This caused a surge of settlement in the west because of the plentiful farm land. 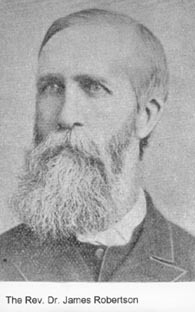 James Robertson was the first Presbyterian superintendent of missions in 1881. 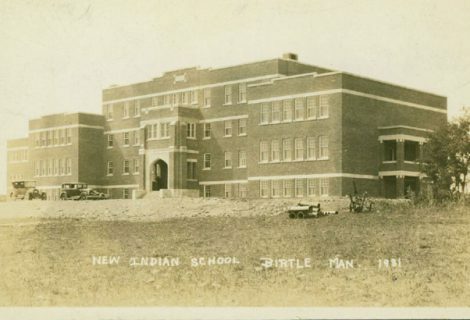 He was based in Winnipeg from 1873 where his role was to supervise regional development, visit mission stations and distribute funding to developing mission sites in the prairie region. British Columbia was added to his region in 1890 which meant that his responsibility for congregational development for the PCC extended to two-thirds of Canada. Travel in the West was difficult, especially in winter months. Robertson was known to have said, “I would far rather have a man know less Latin and more horse” when describing the best men to aid him in breaking through the western terrain. 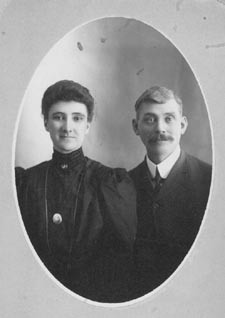 Shortly after graduating from Knox College, Toronto, David George McQueen followed Robertson’s call to the West, arriving in Edmonton in the summer of 1887. He considered work in a foreign mission field, like his classmate Jonathan Goforth, but as the story goes, Robertson put his hand on the young student’s shoulder and said “I want you for Edmonton”; a calling too powerful to ignore. Once in Edmonton, he served briefly with Dr. Andrew Baird, who began the work of organizing congregations in the area in 1881. He quickly built upon this foundation and throughout Edmonton and the surrounding area new congregations were formed under his guidance. For the next 43 years, McQueen served as minister of First Presbyterian Church, Edmonton, helping build, strengthen and maintain a Presbyterian presence in the West. He was elected as Moderator of the General Assembly in 1912 and as Interim Moderator in 1925, and passed away in 1930. Rev. Grant (right), Rev. 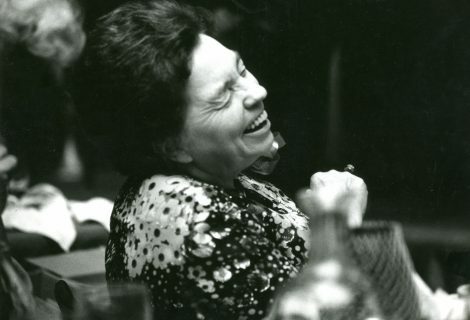 Dickey (left) and four of Rev. Grant’s party. Skaguay, c. 1898. While on the docks in Vancouver in 1897, James Robertson watched the mad scramble of gold-seekers trying to find accommodation on any ship heading to the Yukon. The Yukon Gold Rush was on, and Dr. Robertson immediately saw the need to send a “Man of God” to minister to the prospectors lured to the north by thoughts of striking it rich. 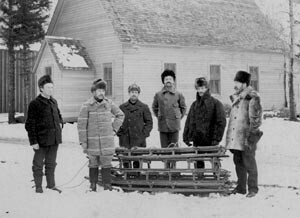 During the next 15 years, twenty-five Presbyterian ministers answered the call to serve in the Klondike. The first to arrive was Robert Dickey, followed closely by Andrew Grant and John Pringle.